Breeanna Straessle is the College of Communication and Information Sciences’ 2018 Outstanding Alumna in Public Relations. Straessle is also a former, two-time judge of the Public Relations Society of America’s Silver Anvil Awards, and she was recently recognized on PRWeek’s 40 under 40 list. Currently, Straessle is a corporate communications manager at Cracker Barrel Old Country Store. 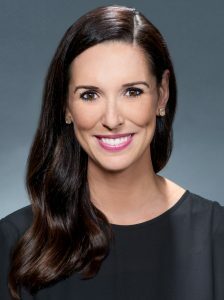 Straessle studied public relations at The University of Alabama as an undergraduate student and went on to obtain her master’s degree in advertising and public relations. At UA, Straessle helped found Platform Magazine and held a seat on the C&IS 2007 Academic Honor Council board. Honor Council and Platform Magazine helped prepare Straessle for her post-graduate career, but her one regret is not being more involved in UA’s chapter of the Public Relations Student Society of America. Straessle attributes a large portion of her success to the instructors at UA who served as mentors and leaders. Straessle plans to continue practicing public relations for large national brands.